The 2017-2018 U.S. Flu Season death toll has climbed to 7 children and 30 adults with several more weeks of Flu activity still remaining, according to the latest data gathered and published by the U.S. Centers for Disease Control (CDC). The proportion of deaths attributed to pneumonia and influenza increased sharply to 9.1% for the week ending January 6, 2018, which is well above what the CDC considers the epidemic threshold of 7.2% for that time of year. The percentage of people seeing their health care provider for influenza-like illness in January 2018 was the highest percentage recorded (6.6%) since the 2009 pandemic. Influenza A(H3N2) is the most common strain of flu virus during the 2017-2018 U.S. Flu Season. 84.2% of the influenza-positive tests reported to the CDC were influenza A viruses and 15.8% were influenza B viruses. Of the influenza A viruses that were subtyped, 86.4% were H3N2 viruses and 13.6% were (H1N1)pdm09 viruses. 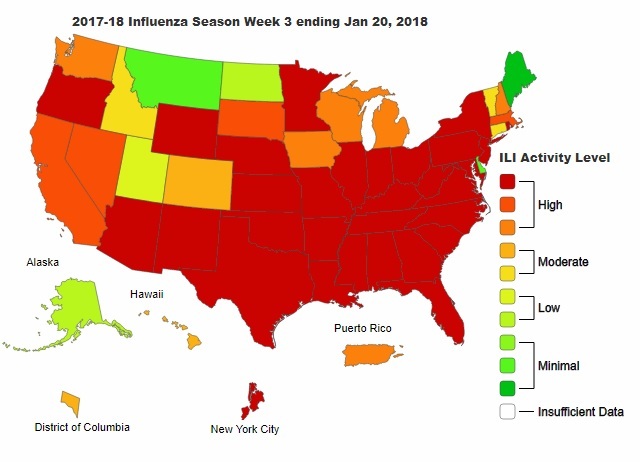 New York City, Puerto Rico, and 39 states experienced “high” influenza activity (Alabama, Arizona, Arkansas, California, Florida, Georgia, Illinois, Indiana, Iowa, Kansas, Kentucky, Louisiana, Maryland, Massachusetts, Michigan, Minnesota, Mississippi, Missouri, Nebraska, Nevada, New Hampshire, New Jersey, New Mexico, New York, North Carolina, Ohio, Oklahoma, Oregon, Pennsylvania, Rhode Island, South Carolina, South Dakota, Tennessee, Texas, Virginia, Washington, West Virginia, Wisconsin, and Wyoming). The District of Columbia along with five states (Colorado, Connecticut, Hawaii, Idaho, and Vermont) experienced moderate activity. Three states experienced low activity (Alaska, North Dakota and Utah). Three states experienced minimal activity (Delaware, Maine, and Montana). 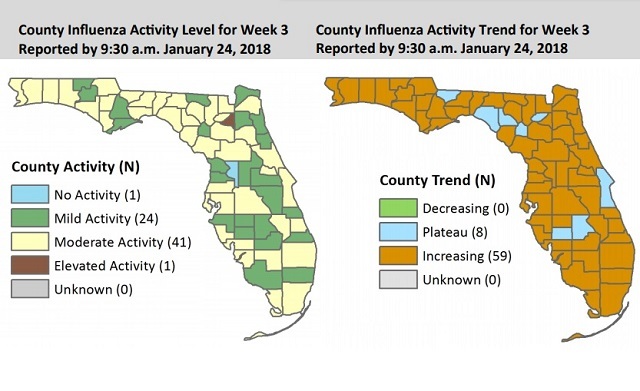 Flu activity increased sharply across Florida and was above peak activity compared to previous flu seasons. Increases were observed in all age groups and in all regions of the state. The Florida panhandle region continued to experience the largest increases in flu activity. Influenza A(H3) is the most common flu strain this year in Florida. For the week ending January 24, 2018, fifty-nine counties reported increasing flu activity while eight counties reported activity at a plateau.